Experiment originally presented here by Tom Bishop. I live along the California Monterey Bay. It is a relatively long bay that sits next to the Pacific Ocean. The exact distance between the extremes of the Monterey Bay, Lovers Point in Pacific Grove and Lighthouse State Beach in Santa Cruz, is 33.4 statute miles. See this map. On a very clear and chilly day it is possible to see Lighthouse Beach from Lovers Point and vice versa. With a good telescope, laying down on the stomach at the edge of the shore on the Lovers Point beach 20 inches above the sea level it is possible to see people at the waters edge on the adjacent beach 33 miles away. I can see children running in and out of the water, splashing and playing. I can see people sun bathing at the shore and teenagers merrily throwing Frisbees to one another. I can see runners jogging along the water's edge with their dogs. From my vantage point the entire beach is visible. Even with the unaided naked eye one can see the beaches along the opposite coast. IF the earth is a globe, and is 24,900 English statute miles in circumference, the surface of all standing water must have a certain degree of convexity--every part must be an arc of a circle. From the summit of any such arc there will exist a curvature or declination of 8 inches in the first statute mile. In the second mile the fall will be 32 inches; in the third mile, 72 inches, or 6 feet, as shown in this chart. Ergo; looking at the opposite beach 30 miles away there should be a bulge of water over 600 feet tall blocking my view. There isn't. Whenever I have doubts about the shape of the earth I simply walk outside my home, down to the beach, and perform this simple test. The same result comes up over and over throughout the year under a plethora of different atmospheric conditions. 2. 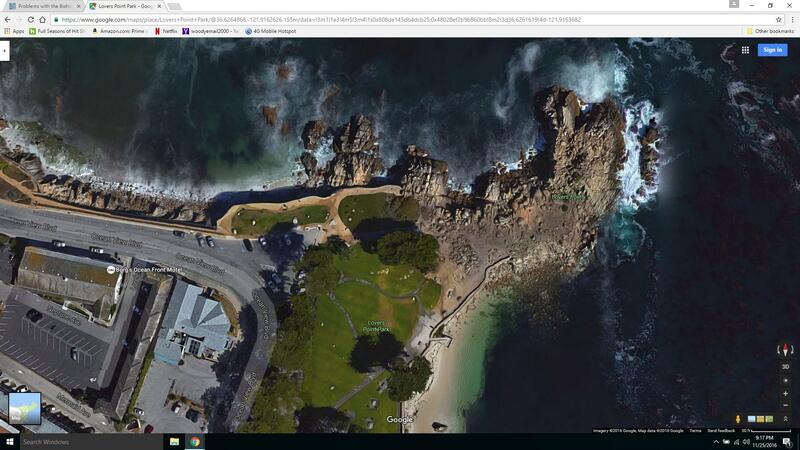 The image he provides to back up his claim was also taken from the south side of Lovers Point, above the beaches. 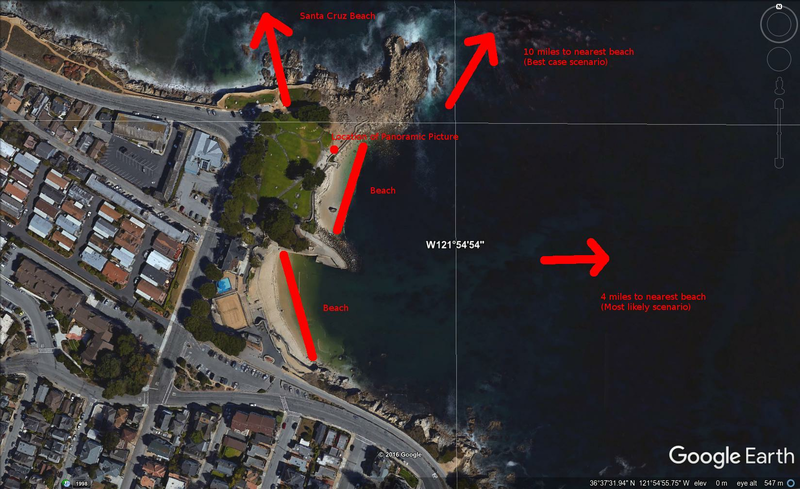 It also does not show the Santa Cruz beach. It shows a beach only 4 miles away looking east from Lovers Point Beach. 3. Others have questioned the physical possibility of seeing that far with a telescope. I have yet to see Tom Bishop reveal what telescope he used, despite requests on multiple occasions. 6. He provides no other photographic evidence, data, or witnesses to back up his claim. All we have to go on is his word. Since it is clear that the Bishop Experiment will remain listed on the wiki, it is probable that someone will bring it up again at some time in the future. Therefore, I decided to list the problems with the experiment as clearly as I could for easy future reference and your viewing pleasure. Just a regular guy. No funny business here. Nicely done. I would say at the very least Tom Bishop botched this experiment and probably needs to run it again. Whatever happened to Tom Bishop by the way? To be clear, I am not accusing Tom Bishop of any intentional deception. It is entirely possible that it was an honest mistake. Or several honest mistakes "over and over throughout the year under a plethora of different atmospheric conditions." To help move along the conversation here is stuff from the topic I started on the subject. Yes, we are aware. The Wiki does not entirely follow the progression of the threads the content is based on. A corrected addendum was provided after the experiment was posted. 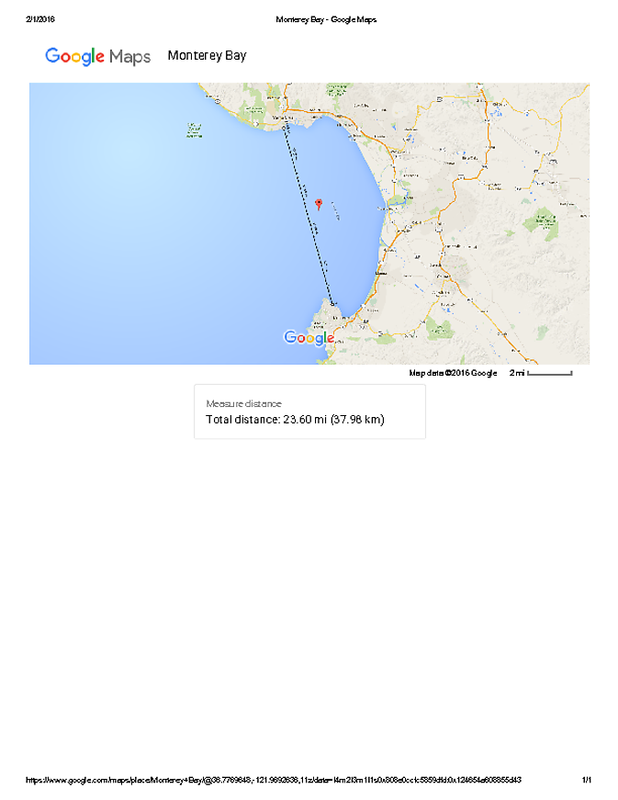 It was found that ~23 miles should produce noticeable curvature as well. Then this is going to be addressed and the wiki edited? You have to admit leaving it as is and having under supporting evidence in both wikis can be misleading to people who read the distances and take it at face value. No, I will not be editing the Wiki. I do not even have write access to it. If I ever get access, I'll fix it. 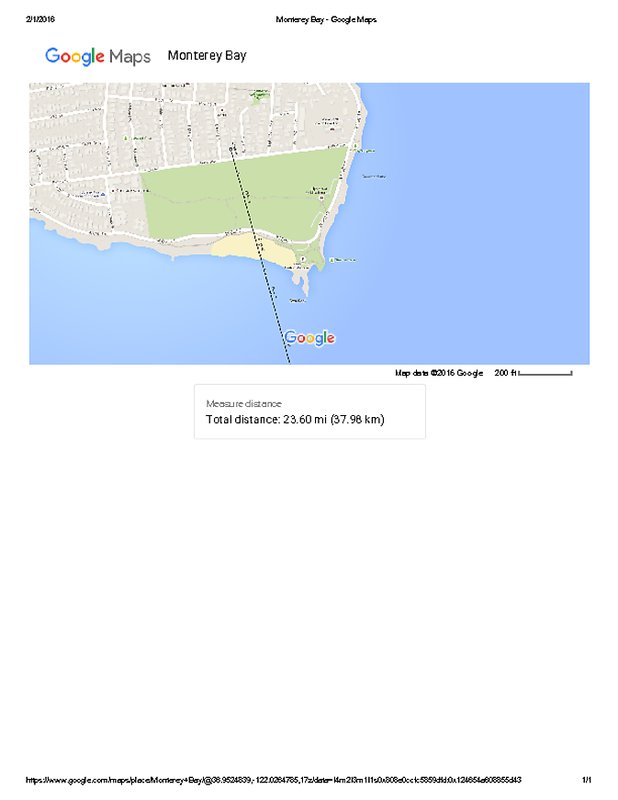 When I first reviewed the experiment I took the stated 33.4 mile as what the actual distance was into consideration while reading your conclusions. It was only when I looked at the linked map that it clicked for me that I was in the area before charted a course in that bay and realized the distance given maybe an error. If it remains up as evidence in the wiki without at least noting the distance of about 23 miles then how can people trust the information in the wiki? It is being offered as evidence of the truth. How is this different then NASA trying to mislead people by releasing fake images of the Earth? I saw somewhere where Tom asked for access to edit the wiki and the reply was they would give him access. Not sure if they did or not. Does bring up the question why Tom feels comfortable with his experiment offered as evidence in the wiki and not pester someone to change it. If he is asking for it to be edited the same question can be asked why who ever he is asking is not changing it. On the other site the only answer I got is even if the distances are wrong it is still evidence the Earth is flat. Another very important distance is the height of the telescope above the water. He claimed the telescope was 20 inches above the water. As the picture in the OP shows on the north side of the park has a steep drop off of at least 3 feet. Very very sloppy work if it was not intentional. If you didn't start 5 threads on the same subject, you wouldn't have to ask the same questions over and over. He never asked, but it's on my to-do list anyway. The simple answer is that people have lives and have more important things to do than correct the repercussions of a couple of inconsequential typos online. We'll fix it when we fix it, complaining about it over and over again will not change that. Have you considered walking down the extremely visible set of stairs to overcome the steep drop? How are you people so bad at this? The simple answer is that people have lives and have more important things to do than correct the repercussions of a couple of inconsequential typos online. We'll fix it when we fix it, complaining about it over and over again will not change that. More important things to do than correcting a thorn-in-the-side mistake that people bring up over and over? If you're tired of hearing about it, maybe just fix it? If time is the issue, you could have saved more than enough time by NOT posting the comment above. I have concluded that you enjoy the complaining of the rounders, and actually have no intention of fixing it. Somebody is probably keeping score, "Another rounder brought up the Bishop Typo, how many is that this year?" You and I discussed this issue back in August. You've ignored the issue ever since. More important things to do than correcting a thorn-in-the-side mistake that people bring up over and over? Absolutely. As I said, people have lives. Jobs. Families. A tiny typo they doesn't affect the final result of the experiment is rather unimportant to those of us who have things to do. If time is the issue, you could have saved more than enough time by NOT posting the comment above. I've already explained this to you. I can write a simple post on my phone. Editing an article (and doing it well, without introducing new errors) requires me to put aside some of my workstation time - be it work time or entertainment time. I'll do it when I'm able to. Not sooner, not later. You've ignored the issue ever since. I haven't ignored it. Back in August, I worked 12 hours a day with a 1.5-hour break in between two jobs. That changed at the end of September. Now I'm a doctoral student who also works part-time. I know it annoys you, but I simply have more important things to do than pander to your whims. Especially when they concern something of so little consequence. I guess it's your story, tell it how you like. Shameless bump of justice, since Tom Bishop seems to be back. Where are these highly visible stairs? Also there is the optics he used. They were really, really impressive. I served in the military in long range surveillance. Optics were a very important part of that job. We did not have access to as good as optics as Tom had. He saw an amazing amount of detail at a 23 mile distance. He avoids answering the optics he used. There is probably a good reason for that. The distances are very important in this experiment. Both the height of the observer and the distance to the target determine what can be seen. If those are wrong then the conclusion can be considered wrong. I will also bring up the amount of time it took you to respond to me the wiki could have been edited. You then will no longer need to respond or see post about the distances. Then it will just be the incredible optics he used. I think you may know what the truth is. At best he was mistaken and observed from the beach on the east of Lover's Point facing the shore only about 3 miles away. If your group/organization is interested in truth correcting the wiki should be a high priority. If your group is willing to spread disinformation and willing to accept anything without question that supports your belief then of course leave it as is. They're quite visible even in your intentionally zoomed-out screenshot. But let's just cut your deception short. Here, here, and here. I repeat, and I will not continue this conversation until you answer: How are you people so bad at this? I will also bring up the amount of time it took you to respond to me the wiki could have been edited. Ah, yes, because a 60-second post typed in on a mobile phone is equivalent to sense-checking and editorialising an Wiki article, both in terms of effort and time. Perhaps you've forgotten who I am and how much free time I have, even though I explained it countless times to you whiners. I have already explained this to you, by the way. In short: No, thanks, I'll do what I want when I want, because I have a better understanding of the constraints which affect my time management. I think you may know what the truth is. I do. The truth is that I'm dealing with a group of worthless whiners who have nothing better to do than whinge about a single typo and pretend that it's somehow an issue. Don't worry, your complaints are being treated with exactly as much attention as they deserve. Clearly you have never had to deal with the issue of limited resources. Unfortunately, between my managerial job (in which - surprise! - I also have to work around a resources shortage) and my doctoral research, I rarely have time for even things of high priority. I still disagree with you that fixing an insignificant typo is a high-priority task, but I've already explained that to you, and you're just pretending to be stupid in an attempt to get a rise out of me, so I'll carry on ignoring that. Once again, I'll point out that the "single typo" was a very minor part of the overall problem with the experiment. The entire experiment is invalid. There is good reason to believe he was looking at the wrong beach, as I demonstrated in the original post. Perhaps you would have to deal with less whining if you acknowledged that the experiment has more holes than a block of swiss cheese used as a pincushion by a seamstress with anger issues and a hand tremor. Perhaps you would have to deal less whining if you acknowledged that the experiment has more holes than a block of swiss cheese used as a pincussion by a seamstress with anger issues and a hand tremor. Perhaps you've forgotten who I am and how much free time I have, even though I explained it countless times to you whiners. Oh Mr precious! Don't forget to mention your doctorate. But seriously. your posted link with the stairs here underlines the problem, we are supposedly looking from above the beach that Tom was laying on, but looking out at the ark of view he would have had, there is no hint of the beach he purports to see through his futuristic binoculars, not just see but clearly watch people throwing Frisbee's. Now it's not the clearest of days when google did this and resolution isn't great but the horizon is visible clearly as a line no hint of land but Tom and his magical glasses on his belly amongst the rocks below was watching the children play, time to come clean Tom, you got the wrong beach. ...time to come clean Tom, you got the wrong beach. Clearly he is choosing option number 2, hoping that it will go away without having to address it. Never did a street view, my bad. Way to assume to worst and thinking I am trying to actively deceive people. I have done my best to make sure things I post are correct. Sometimes I have to be corrected or something pointed out to me. If you think the distances are a minor thing I would rethink that. Even for FE the height of the observer and distance of what is being seen is a very important part of an experiment like this. 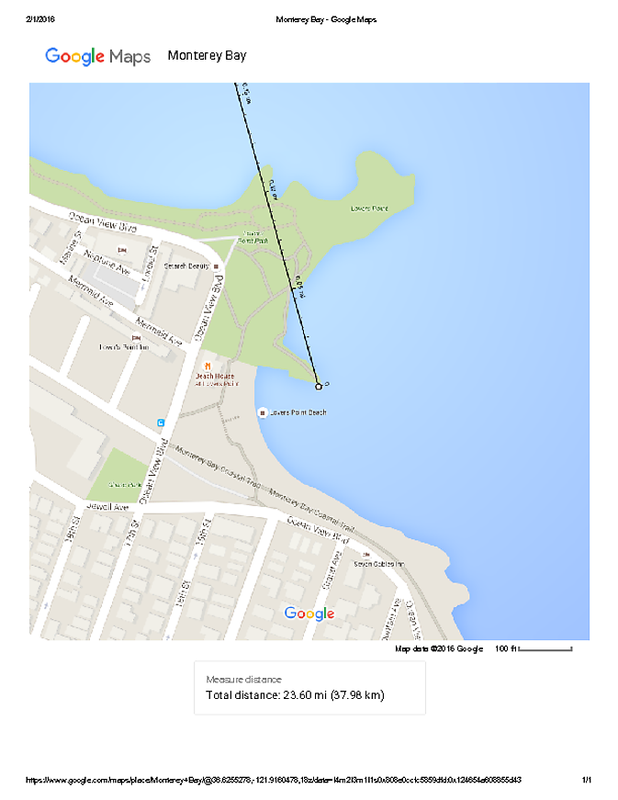 If I recall This issue with the incorrect distances has been known for years now. That suggest FES is willing to distort the truth. Tom said he provided an addendum and asked for the distance to be corrected. Unless everyone over the years with the ability to edit the wiki only access the site with phones there is really no excuse. A day absolutely, week sure, month or two maybe, over a year not so much. Then of course there is those amazing optics. Research why astronomers usually do not make observations when what they want to look at is near the horizon. Then research why telescopes designated as spotting scopes are designed with less magnification then ones designed to observe the heavens. I posted examples you can do it yourself if you have a telescope. Go out and see if disturbances in the atmosphere hinder what you can see if the magnification is too great. Tom needed a lot of magnification to see what he claimed to see. The FES is claiming to be spreading the truth. It hurts your cause to have something that is easily verified as being wrong in your wiki. Whether you believe the Earth is flat or round if all the distances are wrong in this type of experiment it surely should not be offered as conclusive proof. I think we can all agree a mile is a mile regardless of the shape of the Earth. Keep it civil or I will have to lock the thread.